In a large, open-space office, employees are busy processing promotional coupons for a well-known supermarket chain; a few cubicles down, their colleagues are collating promotions and deals for an e-commerce website; further along, developers are testing an app across a battery of smartphones and tablets; downstairs, call center operators are fielding customer service calls for various French companies. These are just some of the services offered by Outsourcia, a business processing and outsourcing (BPO) company in Madagascar. With the advent of the digital economy, artificial intelligence and the explosion of e-commerce, the BPO sector has flourished over the past 15 years, meeting companies’ insatiable need for data, real-time services and presence across multiple platforms. And whilst it’s the likes of India and the Philippines that have met the needs of Anglophone markets such the US and the United Kingdom, it is countries like Morocco, Tunisia, Senegal and Mauritius that have served the Francophone market. And increasingly, Madagascar too. 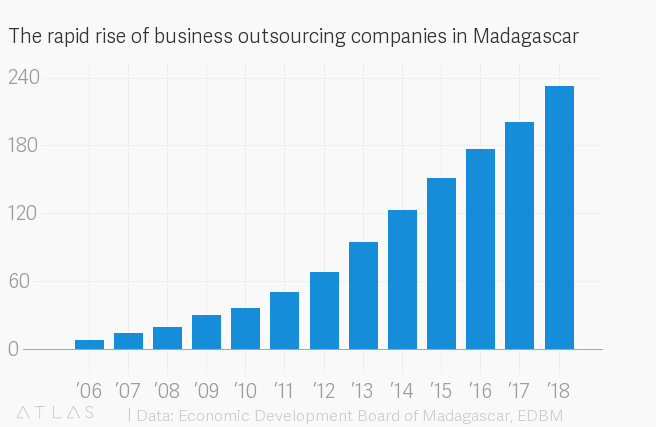 There are now 233 BPO companies in Madagascar (up from just a handful in 2005, mostly in the capital Antananarivo, employing between 10,000 and 15,000 people (Morocco, the market leader, has 70,000). The reasons companies are flocking to Madagascar is a combination of cost and quality. With salaries starting at $130 a month Madagascar is 50% cheaper than Morocco for business outsourcing, with similar levels of quality. With salaries starting at $130 a month (nearly three times the minimum wage) Lalatiana Le Goff, director general at Vivetic, the oldest BPO operator in Madagascar and one of the largest with 1,400 employees, says that Madagascar is 50% cheaper than Morocco with similar levels of quality. “The Malagasies are diligent and have a real desire to learn,” she says. They also have a natural empathy, which, combined with the right training, makes them perfectly suited to handle disgruntled customers. Then there is the language. The level of French is very good, and customers appreciate Malagasy French. “The tone is softer and slower [than in the Maghreb]; some people have an accent but it’s mild and hard to place,” says Ludovic d’Alançon, chief operating officer at Outsourcia, a Moroccan BPO company that acquired two companies in Madagascar in 2016, which employ 550 people. The time difference is also minimal (one hour in summer, two in winter). What transformed the sector from data processing niche to stellar digital player however is the arrival of cable internet connection in 2009. Madagascar now boasts the fastest internet speed in Africa (faster even than many developed countries), a pre-requisite for good quality calls and real-time services. Since then, the number of companies has steadily grown. A clear indication of the sector’s success is the high profile of the companies it serves. Vivetic for instance provides customer service for Deliveroo, a major food delivery company, for whom they manage the riders, clients and restaurants across multiple platforms – “we can do three chats in parallel with excellent grammar and spelling” – and multiple registers: operators use the formal “vous” for customers but the more informal “tu” for riders, with a chattier approach. They also process invoices for Voyage Privé, a high-end, flash sales travel website, working directly in their accounting system; and they handle subscriptions renewal for women’s magazine Marie-Claire. Given the sensitive nature of some of these tasks, Vivetic complies with the EU’s strict General Data Protection Regulation (GDPR) directive on data privacy. Such is the reputation of the sector that clients now specifically request the country for their outsourcing needs, says Le Goff. For Madagascar, where 75% of the population lives on less than $1.90 a day, the emergence of a wealth-generating sector that creates employment (unlike mining) where the starting salary is several times the minimum wage (unlike textile) is a game changer. “The sector could have the same effect on Madagascar as it did on Morocco where it helped create a middle class,” says d’Alançon. Youssef Chraibi, president of Outsourcia, explains that the BPO sector in Morocco not only raised the bar for salaries (which has a multiplier effect on consumption and access to credit), but also for social benefits (pensions, health insurance), the employment of women (who make up 50% of employees) and education, with BPO companies providing extensive on-the-job training. Many of these best practices are now standard in the sector in Madagascar. The challenge going forward will be to sustain growth. Le Goff says that there is no shortage of labour, just not enough skills. Poaching is commonplace. Operators have recently set up a trade body, Goticom, to work on common issues such as training and to find synergies: call centres start early and finish late and ferrying staff home in the absence of reliable public transport is expensive, as are multiple back-up generators to avoid frequent power cuts. The country has just elected a new president, Andry Rajoelina, and whilst his election manifesto didn’t specifically list the BPO sector, he’s understood to be strongly supportive. That, and some choice infrastructure improvements, will go a long way in ensuring long-term growth.